Johnson, L., Wilcox, S., Mankoff, J., & Stricker, R. B. (2014). 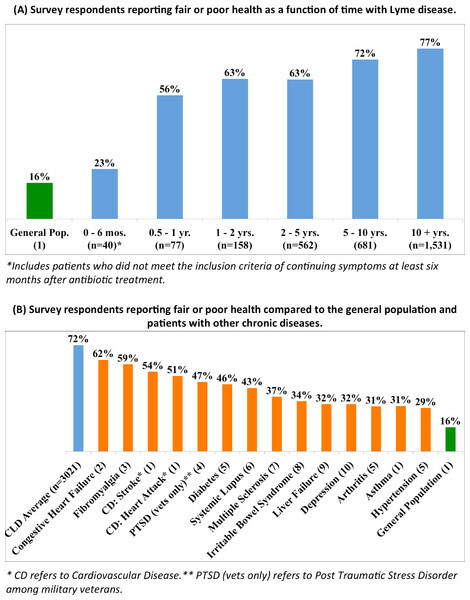 Severity of chronic Lyme disease compared to other chronic conditions: a quality of life survey. PeerJ, 2, e322. The Centers for Disease Control and Prevention (CDC) health-related quality of life (HRQoL) indicators are widely used in the general population to determine the burden of disease, identify health needs, and direct public health policy. These indicators also allow the burden of illness to be compared across different diseases. Although Lyme disease has recently been acknowledged as a major health threat in the USA with more than 300,000 new cases per year, no comprehensive assessment of the health burden of this tickborne disease is available. This study assesses the HRQoL of patients with chronic Lyme disease (CLD) and compares the severity of CLD to other chronic conditions.